Supply chain management junior Sergio Ramirez co-owns Lagarto Boots Western Wear with his mother, Laura Perez. Together, they’ve served the Cypress community for four years, providing boots and apparel for men, women and children. At age 10, Ramirez came to the United States from Mexico with his family in the hopes of expanding the family trade, boot making. The family opened their shop in Cypress, just north of downtown Houston — the market was open there for western wear, Ramirez said. Even though he was involved at an early age in developing Lagarto Boots, Ramirez wasn’t always sure he’d one day run the place. The lessons Ramirez is learning in Bauer College classrooms have already inspired him to continue to pursue his entrepreneurial dreams. “I remember sitting in Jamie Belinne’s GENB (Connecting Bauer to Business) class my first semester, and she was talking about skydiving,” Ramirez said. 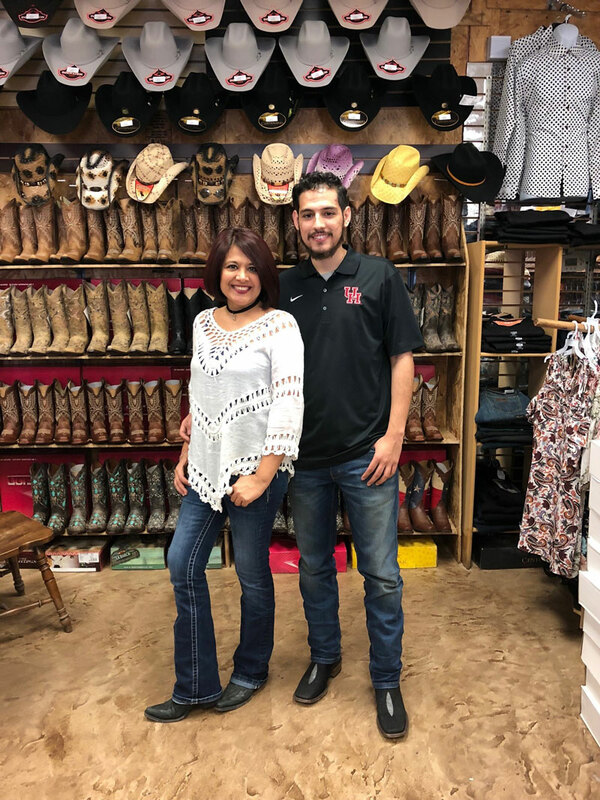 Supply chain management junior Sergio Ramirez co-owns Lagarto Boots Western Wear with his mother, implementing the knowledge and skills he is learning at the Bauer College. Photo by Laila Ramirez. In addition to mentorship from Assistant Dean for Career Services Jamie Belinne, Ramirez says he also learned important lessons from entrepreneurship Clinical Assistant Professor Carlos Ortega. Congrats!!! I’ll be down to get a hat!